Daniel Ryan (Ph.D. Mathematics, Univ. of Miami, 2011) investigated the role of non-random dispersal strategies in ecological systems and the effects of these dispersal strategies on species distribution and community composition. Ryan used various types of models, including partial differential equations, integro-differential equations (for kernel based dispersal schemes), and individual based models. The models were used to investigate questions about evolutionary stability of movement strategies, stability of coexistence states in multi-trophic communities, and the effects of inhomogeneous environments on species distributions. Additional work completed during the NIMBioS postdoctoral fellowship included two computationally-focused side projects. The first project developed an algorithm for the in silico design of a specialized library of gene variants that systematically vary codon usage patterns by synonymous substitution. The resulting library of genes should be useful to experimentally test hypotheses about the effects of codon usage bias on gene expression. The library is designed so that it can be assembled in a simultaneous, combinatorial fashion via Gibson Isothermal Assembly. This results in huge savings compared to assembling each gene in the library separately. The second project used a neural network model to predict mortality risk for intensive care unit (ICU) patients in a hospital. The model takes information collected about the patients in the first 48 hours for their stay in the ICU and uses this to predict a risk of mortality for the remainder of their stay in the hospital. Accurate risk assessment for incoming patients can help to improve both quality of care and improve evaluation of treatment effectiveness. 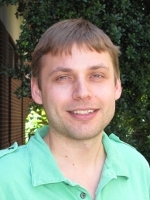 Following his postdoctoral fellowship, Ryan took a position as a database administrator. Ryan D, Cantrell RS. 2015. Avoidance behavior in intraguild predation communities: A cross-diffusion model. Discrete and Continuous Dynamical Systems, 35(4): 1641-1663. Ryan D, Cantrell RS. Avoidance Behavior in Intraguild Predation Communities: A Cross-diffusion Model. Submitted. Attended NIMBioS Postdoc Career Development Seminars, NIMBioS Interdisciplinary Seminars, UTK Math Department Seminars and CISML Seminars at UTK.